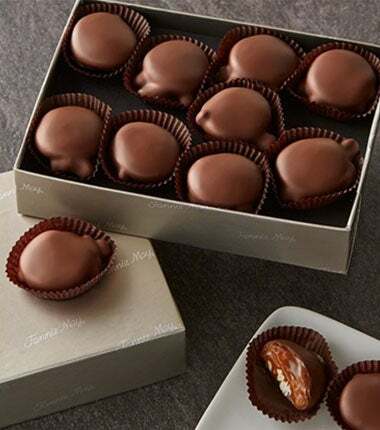 There is a world of difference between crafting chocolates in a small shop kitchen and creating epic quantities of confections to be sold on countless store shelves around the country. 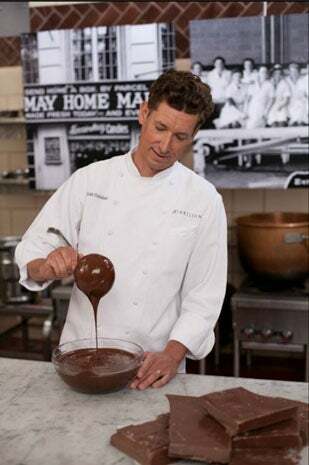 Read on to see how that comes in to play on a day to day basis for Elliott Callahan, the chocolatier responsible for research and development at Fannie May, home of the Pixie, the beloved chocolate treat that has been around since 1946. Most of my responsibilities at Fannie May center on research and development, so my time is often split between hands on work in the kitchen and more analytical work. 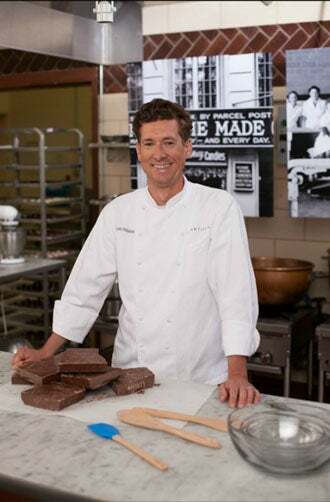 I can sometimes be found in the kitchen making new confections, sometimes out in the factory testing new products and ingredients or troubleshooting a problem with an existing product. At other times, I spend my days gathering data or documents, assembling information, and looking for answers to production challenges. Because we make chocolates in such large quantities, a lot comes into play when we are developing a new product. We pilot new ideas in the test kitchen, send them to our merchandising team for feedback, and, when everyone agrees we have a potential winner, we send it to the production floor for testing. 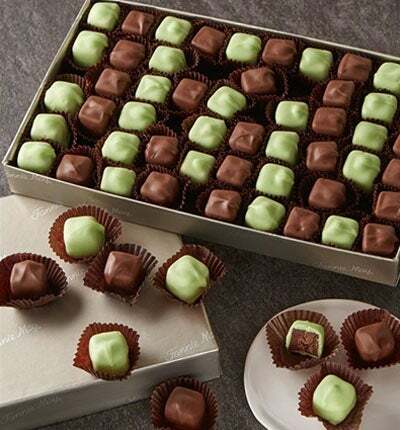 We make 1000 pounds of the new chocolates and put it through rigorous shelf life experiments and market tests. Once the chocolates meet our requirements, they get put into full scale production. I have been interested in cooking and baking since I was a child. I worked in restaurants and food businesses while I was in high school and went to cullinary school after college to study baking and pastry making. After graduating from cullinary school, I worked as a pastry chef for the Ritz Carlton Hotel Company before joining Fannie May in 2011. The manufacturing world is very different from the restaurant business. In a restaurant it’s easy to experiment with recipes because you’re working with relatively small sample sizes. In manufacturing, you make things in massive quantities that require more calculated planning. Before you make a 1000 pounds of chocolates, you have to know what you’re doing. Your confections also need to tolerate being frozen and shipped before being put on display. Ove the course of a year, we use about 8 million pounds of chocolate, so we can’t afford to get the process wrong. Science allows me to understand how ingredients affect each other at each stage of the process and how they can survive each production step. Everything we learn helps us create very methodical processes for planning and executing every step of the way. The science doesn’t come second nature to me, but I find it fascinating. The added benefit to working in manufacturing as opposed to a restaurant kitchen is that you have access to people who can answer the questions that arise whenever you’re working with chocolate. In a restaurant, you rely on trial and error or instinct, in my world, we rely on science to guide us. When I was in culinary school I never thought that my journey would take me from classic pastry to food science, but I’m still equally enthusiastic about both ends of the spectrum. Most of the new confections that we create are designed to meet a particular set of criteria. We never start with a blank canvas and just “create.” We think about who our customers are, what season we’re creating for, whether the piece will be molded or enrobed, and if we’re going to be working with milk or dark chocolate. We also juggle exploring new foods and flavors with the fact that our customers don’t associate our brand with extreme or strange flavor profiles. 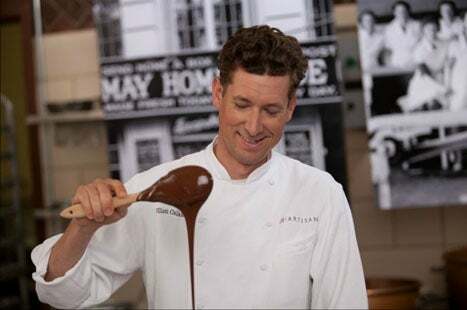 People come to Fannie May because they love the nostalgic element of our confections which is why most of our recipes and processes have remained unchanged for decades. That said, I believe that it is important to be constantly exploring food and flavors. I love exploring immigrant markets and flipping through cookbooks or food blogs to get inspired and keep up with current food trends. Working at Fannie May is wonderful. I get to walk through a chocolate factory as part of my job! That never stops being fun. Plus, when I get out of my car at work in the morning, everything smells like caramel; it’s the most intoxicating aroma. I love telling people where I work and seeing their eyes light up. I actually think that people expect me to walk around with chocolates in my pockets, so I can hand them out all day long. I never get bored with chocolate, though sometimes my desire for certain flavors ebbs and flows. The good news is that there’s always something else to explore and enjoy. My go to Fannie May gifts vary based on my current favorites, but I find that a box of Pixies is always welcome!